As a kid, my favorite part of summer was playing outside. Well, and of course the long break from school. As an adult, my favorite part of summer is the abundance of fresh produce. Memories of washing off a carrot just pulled from the garden, and munching on it with the greens attached just like Bugs Bunny. Or going strawberry picking with my mom and worrying that they really were going to weigh me before and after, to charge us for all the berries I ate while picking (can you tell it was a lot?). Large green salads served alongside grilled steaks. Or simply the rainbow of color in a fresh fruit salad. These days, I think more about how little room I have in the fridge after picking up the weekly produce box or hitting my favorite markets to stock up on fruit. 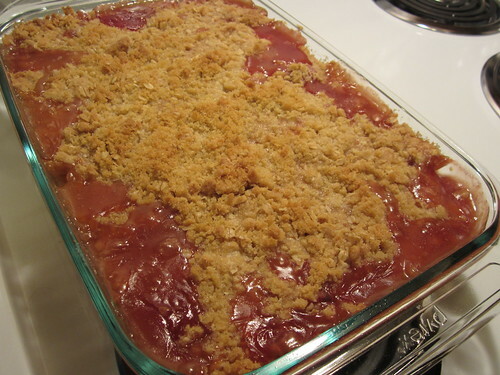 With the heatwave just beginning, and a fresh bunch of peaches and raspberries in my fridge, I remembered that I had yet to post this summer recipe for a peach raspberry crisp. The original recipe has you peel the peaches, but I have to say, it’s not worth the extra work and time. Peach skins are so thin that when baked, they seemingly melt in your mouth. Leaving the skins in place makes this an extremely quick dessert to prepare, though it does need to spend some time in the oven. It’s best to make if you’re going to feed a crowd, as a crisp doesn’t stay crisp all that long in the height of summer. Preheat oven to 350*F. Butter 13x9x2 inch glass baking dish. Slice peaches into wedges and place in large bowl. 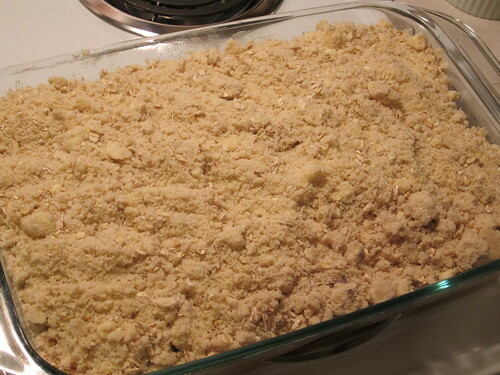 Add 1/4 cup sugar, 1/2 cup brown sugar, almond extract, and 2 tablespoons flour. Toss to coat. 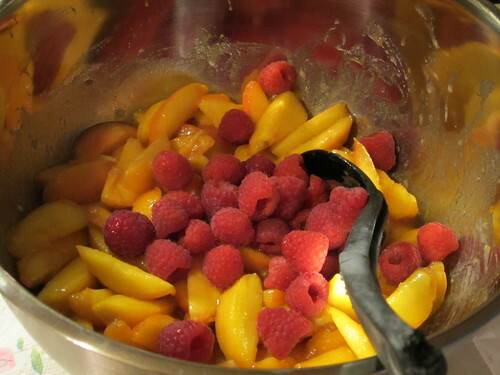 Mix in raspberries and let sit for 5 minutes. Transfer to baking dish. With a stand mixer fitted with paddle attachment, mix 1 1/2 cups flour, 1 cup sugar, 1/2 cup brown sugar, salt, oatmeal, and butter on low until crumbs form; sprinkle over peaches. Bake 1 hour, or until juices are bubbling and top is brown and crisp. Serve warm. Store leftovers in fridge, reheating in a 350* oven for 20 minutes. 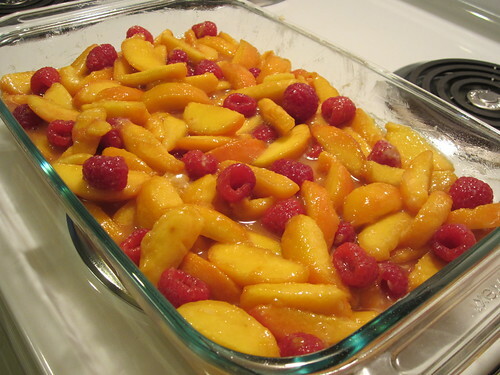 For some reason i never think to do raspberries and peaches together, but what a wonderful combo! Yum. PS – totally agree with you on the peach peel thing. I hate peeling peaches! you have to apply these techniques to your won website.